The Republic of Formosa is was a short-lived republic that existed on the island of Taiwan in 1895. The Republic was proclaimed on 23 May 1895 and extinguished on 21 October, when the Republican capital Tainan was occupied by the Japanese. After the Sino – Japanese war many parts of China were ceded to Japan. However, Taiwan proclaimed independence and announced the birth of a republic state namely Formosa. Further, the Republic faced serious political upheavals as the two Presidents of the country ran away. Finally, when the Republic was 150 days old the capital city – Tainan was captured by the Japanese army on 21st October 1895. In the minimal days of existence, the Republic of Formosa issued a stamp. However, very less information is available on this stamp. The stamp depicts a Tiger in the centre surrounded by Chinese letter on four sides. 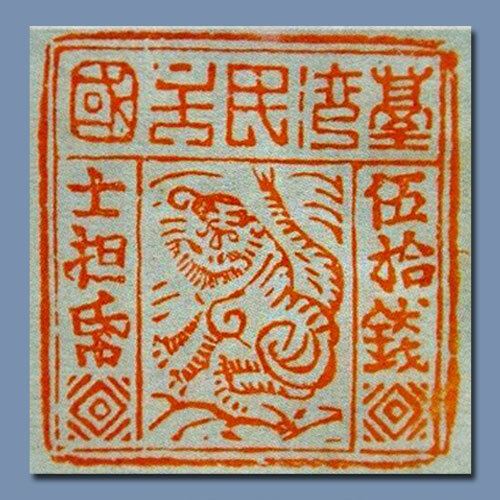 The stamp of the Republic of Formosa is probably the First Tiger Stamp in the Postal History.